You don't want to take this one off your list! You can enjoy Maintenance Free Living in a 55+ gated community. 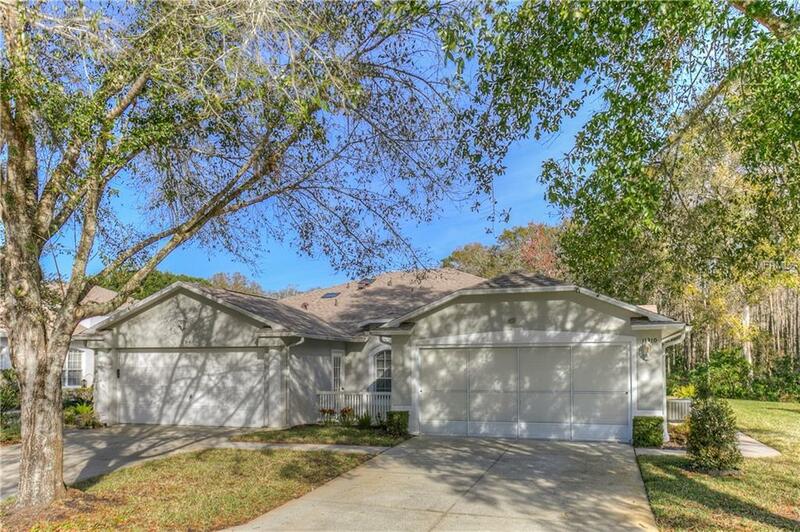 This large Summertree Villa has 2 Bedrooms, 2 Bath, & 2 Car Garage. This Lovely Villa has a peaceful and serene pond and wooded view. The spacious open floor plan has vaulted ceilings, plant shelves, crown molding, and tile throughout the great room. The kitchen was upgraded with granite countertops and beautiful cabinets. The Kitchen is very spacious with tons of cabinets & counter space and a huge walk-in pantry. There is a great breakfast area which overlooks the pond and wooded area. The spacious master bedroom features a skylight, walk-in closet, and an updated suite master bath. The bedrooms have laminate wood flooring. Other features included an 8x11 enclosed lanai with acrylic windows, inside utility, Roof replaced in 2018, HVAC in 2016, water heater 2018. Your HOA fees includes; Roof, Exterior Paint, Lawn & Sprinklers, Water for Sprinklers, Cable, Trash, Clubhouse, Billards Room, Swimming Pool, Tennis, Shuffleboard, Fitness Center, & so much more!! Golf is available but not included in your HOA fees. Listing provided courtesy of Century 21 Affiliated Ii.